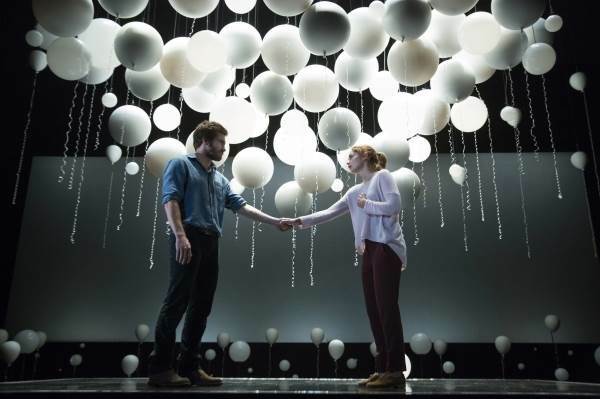 There is far less than meets the eye in Nick Payne’s Constellations now at the Manhattan Theatre Club’s Samuel J. Friedman Theatre. The exquisitely detailed performances by Jake Gyllenhaal and Ruth Wilson cannot hide the dearth of material. Not even the brilliant direction of Michael Longhurst nor the scintillatingly abstract set of Tom Scutt, nor the sparkling lighting of Lee Curran can turn this pretentious exercise in space/time manipulation into a substantial work of theatre. Roland (Mr. Gyllenhaal), a beekeeper meets and woos Marianne (Ms. Wilson) a physicist/professor. They live in what the production disingenuously calls “The Multiverse” in the “Past, Present and Future.” They have the usual ups and downs of reasonably young lovers including discussing their professions, their pasts and their feelings. The playwright takes about 15 minutes of conversation tidbits, repeats the dialogue, virtually intact, with different lighting, different emotional readings, different physical placements, giving the 70 minute work a false feeling of structure. An extended conversation about kissing elbows—that is, the impossibility of kissing elbows—goes on for about five minutes with all its permutations. A marriage proposal is done every which way: standing, kneeling, facing each other, facing away, making the characters feel like acting school students working on a scene. About two-thirds of the way through this exercise in repetition as drama, Mr. Payne introduces the requisite reliable gimmick of a fatal illness which, again, is discussed in all its glorious ways. It’s easy to be dazzled by the lithe, piquant performances of the two stars. It all makes one wonder why the playwright didn’t have enough trust in his characters, both undeniably delightful, to write a straight forward romantic comedy. The gimmickry reeks of trying too hard to be original. Sadly, Mr. Payne is decidedly not original. These ideas were used before, most notably in Michael Frayn’s Copenhagen and David Ives’ All In the Timing which both used re-dos to better effect. Heck, even Tom Stoppard explored this material in his quantum mechanics inspired Hapgood and Arcadia, both of which played with the idea of distorted time and place. There’s no question that the Manhattan Theatre Club has pulled no theatrical punches in staging Constellations. The staging is definitely blessed by its talented actors, the director’s acumen, and a physical production that nearly masks the underwhelming writing.